Noah is on a quest to complete a Global Big Year of birding. He’ll be the first person to do a full year of non-stop birding, except for about 6 hours of sleep every night! The route he takes will certainly be scrutinized and will no doubt set the standard for others who might follow. He is self funding the trip largely through an advance on a book contract with Houghton Mifflin. Most of his trip was planned well in advance, but for the year-end he had a couple of possibilities and eventually decided to go back to India where he had been earlier, but on this occasion to Assam. So the Singapore stopover was just the result of travelling from Perth to Delhi, and with a few hours at hand, he looked for an opportunity to turn that into a few more birds. I was contacted in early December and decided to accept the challenge! Looking at his flight schedule, I could see we’d only have about 2 hours of real birding by the time we got in and out of the airport. So I had to pick some target birds that were reliable among those he still needed. Singapore happens to have a couple of specialty birds that are easier to see here than anywhere else. 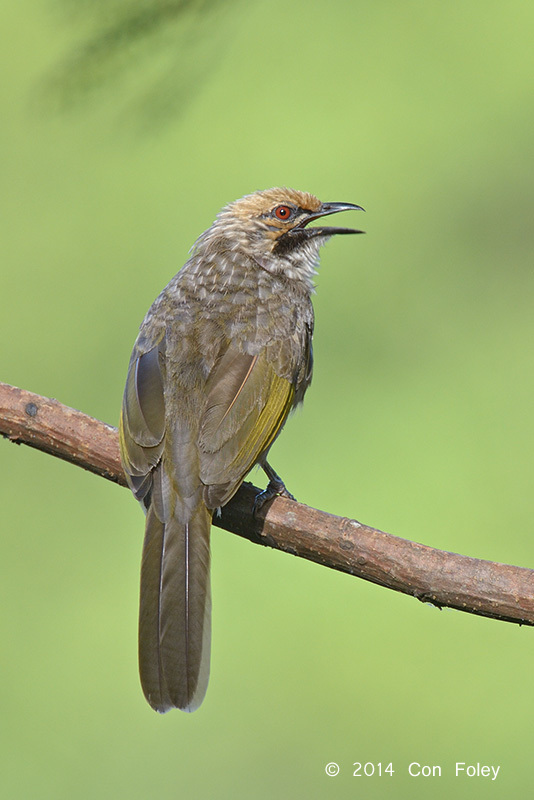 The Straw-headed Bulbul is native species; a handsome bulbul with a beautiful song that is sadly trapped out throughout most of its native range, but is doing very well in Singapore. The Tanimbar Corella is another, this bird has been feral in Singapore for over 30 years, and is so much easier to see here rather than making the long trek to the Tanimbar Islands in remote Indonesia. But the afternoon is not the best time of day for birding, and at the end of December the afternoons are often washed out as the monsoon rains are at their maximum. So watching the weather as the days counted down was certainly a factor, but as luck would have it the strong El Niño event this year has kept Singapore relatively dry. And on the day itself, the afternoon weather turned out to be perfect, not a hint of rain, sunny with high clouds and a bit of a breeze, and not overly hot. Noah sent me his list of needed birds, and I shared this with the Singapore birding community to look for more ideas. Besides the two key target birds, Bidadari seemed like the most logical place to look for other needed birds as it’s a wonderful migrant trap and has recently hosted many of the desired birds including Hodgson’s Hawk Cuckoo, Green-backed Flycatcher, Narcissus Flycatcher, Japanese Paradise Flycatcher, Lanceolated Warbler, Crow-billed Drongo, Eastern Crowned Leaf Warbler and many more. 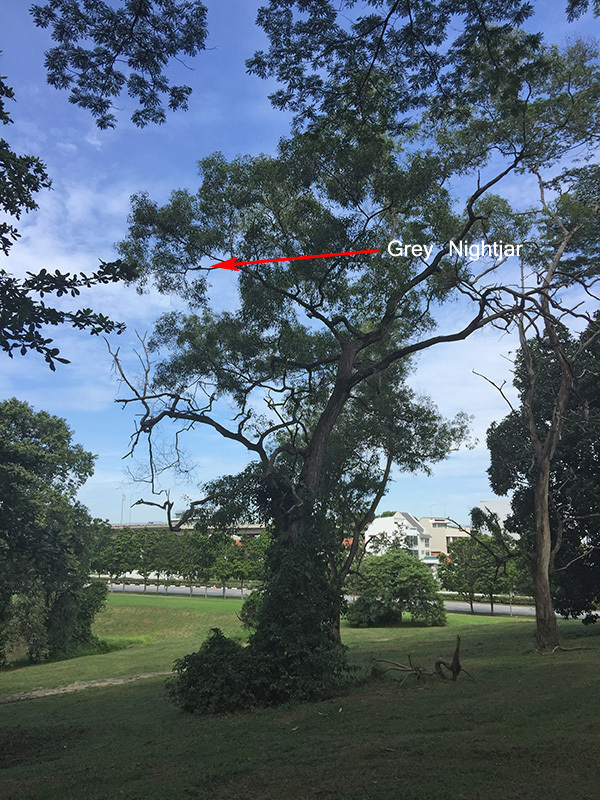 About three weeks before Noah’s arrival a Grey Nightjar was spotted in Bidadari, and this was also a bird he needed. 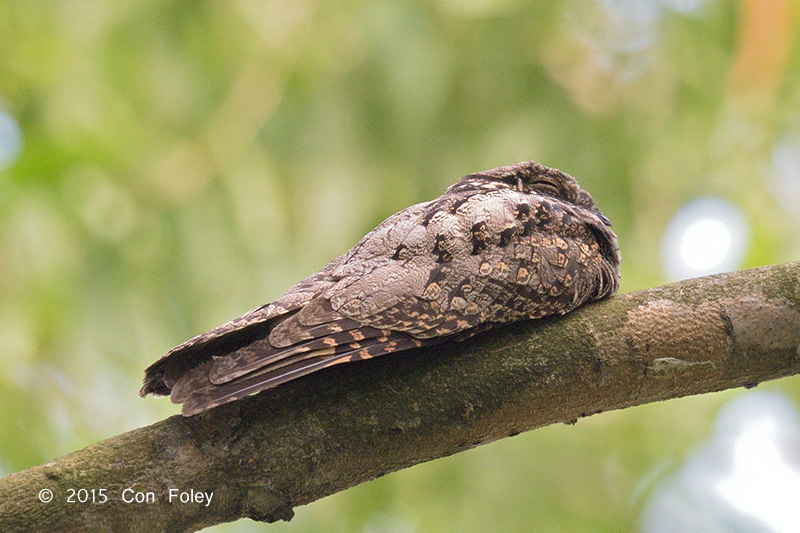 Usually our Grey Nightjars are passage migrants, staying only for a few days before moving on. But I started tracking this bird and Bidadari in general making almost daily visits there. And every day the nightjar was still there! On the morning of Noah’s visit I went again and there the nightjar was! So now we had three good birds likely to be seen. But there wasn’t much else in Bidadari, so it didn’t look good for bonus birds. On the way to the airport to fetch Noah I visited Changi Village and easily found the Tanimbar Corella. 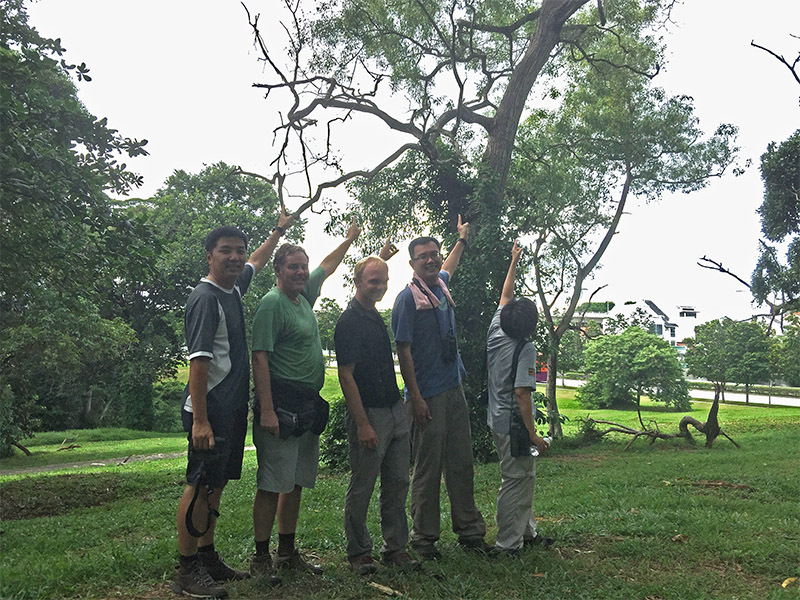 And the day before I had visited Bukit Batok and surveyed where the Straw-headed Bulbul was likely to be in the afternoon. And on the day itself, I got a big helping hand from Low Choon How who volunteered to go stake out the bird pending our arrival. Luck was on our side and Noah’s flight landed 30 minutes early, so picking him up from the airport we had a bit of extra time on the clock. Arriving at Bukit Batok, Choon How had already spotted the Straw-headed Bulbul and pointed four of them out within a couple of minutes of parking the car! Then a quick drive over to Bidadari, and of course the nightjar was still where it was in the morning; and also so were a bunch of birders who had turned out to scour Bidadari for some extra goodies (Noah in the middle). 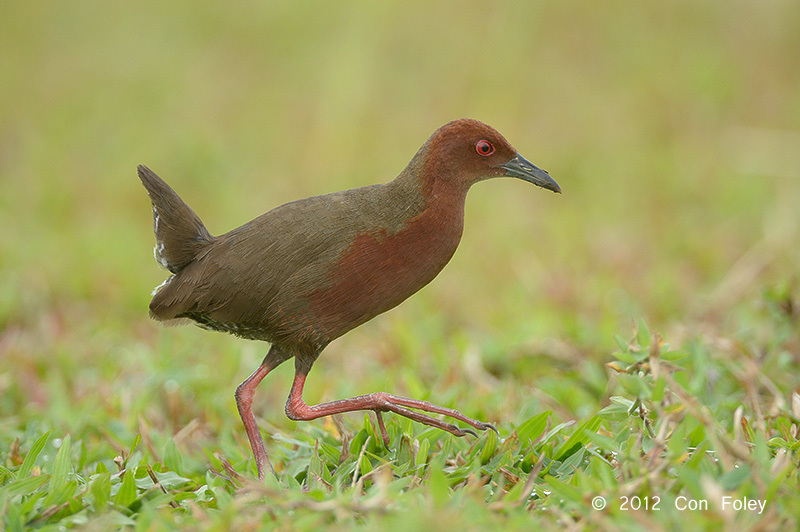 Hearing about the location of a Ruddy Breasted Crake from Lim Kim Keang and having some extra time since the first two ticks were so easy, we headed north to Punggol Barat. And just like birding should be everyday, the crake called from exactly the reported spot but was too shy to come out. Never mind, heards are also good. And then a dash over to Sengkang floating platform for the reed warblers. The Black-browed and Oriental were easy, but the needed Pallas’s Grasshopper Warbler and Lanceolated Warbler couldn’t be enticed to sing or dance, so we dipped on them. 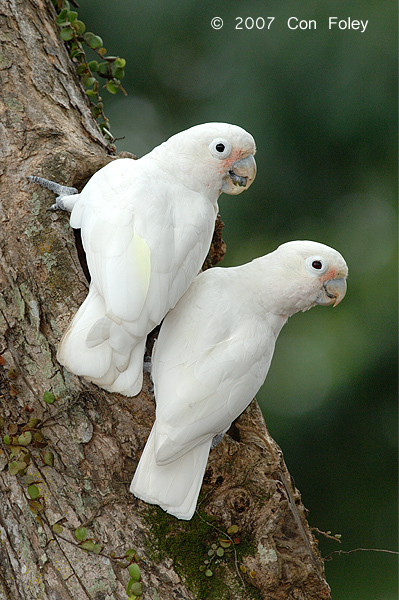 Then the drive back out east to Changi Village; and four Tanimbar Corellas were waiting for us. Dropping Noah off at Terminal 3 in time for his flight to Delhi, he finished the day with 4 Singapore ticks just 11 birds short of 6000 for his Global Big Year. Noah commented that Singapore was his shortest birding stop, but actually if we had had a full day no doubt we could have gotten him much closer and I suspect over 6000. Thanks to Low Choon How, Lim Kim Keang, Alfred Chia, Yong Yik Shih, Chung Cheong, Tan Ju Lin and Ping Ling for your support and presence on the big afternoon and for many others via your suggestions by social media.